Fun & Engaging Activities for Toddlers | Discovering new and creative ways to teach and engage toddlers in active play and active learning. We’ve finally wrapped up a series on the 7 days of creation and I am going to try and organize it into posts. Let me just say it took us A LOT longer than 7 days! I basically used the creation story to focus our learning time. I never intended to get through it in one week since I also used this as the backdrop for a lot of academic activities. I was developing and organizing as I went… as well as dealing with pregnancy, lots of travelling, lazy weeks, and distractions… so I was ok with moving slowly through it all. You could pick and choose activities from the entire series to complete in one day, one week or one month depending on what fits your schedule. You’ll see that what fit our schedule was spreading it out over months (we started last summer and ended in the winter). This was not our only Bible lesson during these months. But it became a great backdrop for so many other Bible stories we learned during the same time. My goal was to teach J about the greatness of God as expressed through His creation (or honestly to breach the surface of that topic, since the greatness of God simply can’t be covered in its entirety even in a lifetime of learning!). I also wanted to couple the greatness of God with the truth that this same God created, knows, loves, helps, and has plans for J too…. a truth that I just find amazing. My current plan is one Creation post each week, so I should be finished 7 weeks from today. We’ll see how long each post becomes. I might have to split some up to simplify things a bit. I used crafts, games, discussions, memory verses, books, and whatever came to mind that would work for each day of creation. I hope you enjoy and find some of it useful! I was just doing some birthday shopping and noticed a sale on one of our favorite learning tools. I thought I’d hop on here to share real quick. I came across Nab-It in the store about a year ago and it has been such a valuable tool. It is actually a game but I honestly have not even read the instructions and haven’t yet played the game as intended. I’ll get around to learning that soon hopefully. We’re having enough fun with the pieces right now. 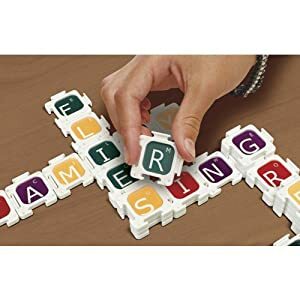 The game consists of 4 sets of letter puzzles, each a different color and each in their own drawstring bag. Each puzzle piece has a letter on both sides. Your little one will get used to looking on both sides for the desired letter. We have used them to practice the alphabet, spelling words, word families, and blends. 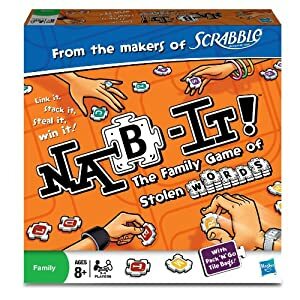 Amazon has Nab-It for sale right now. If you’re in the market for a fun preschool tool that will double as a fun game when your little one is older, this would be great! I’m attempting to record all our favorite activities that I just never got around to writing about. This is one of the activities we did as part of our focus on Creation. I was hoping to do a whole series of posts on our Creation activities. But since it’s been almost 2 years and I still haven’t gotten around to the task, it’s pretty safe to say it’s not gonna happen. Our landform activities were simply too fun not to share though! We were talking about how God created the land and focused awhile on the different types of land we see. I was using the Creation story to fulfill our “science” activities. I chose 5 or 6 landforms (it’s been awhile so I can’t remember exactly) to focus on and printed one photograph and one illustration of each. I found all the pictures online. It would probably be a good idea to laminate these. Our pictures certainly got messy. Matching– First I had J match the illustration to the corresponding landform photo. This is a great way to practice matching for any category, especially if your child has no trouble matching 2 pictures that are the same. 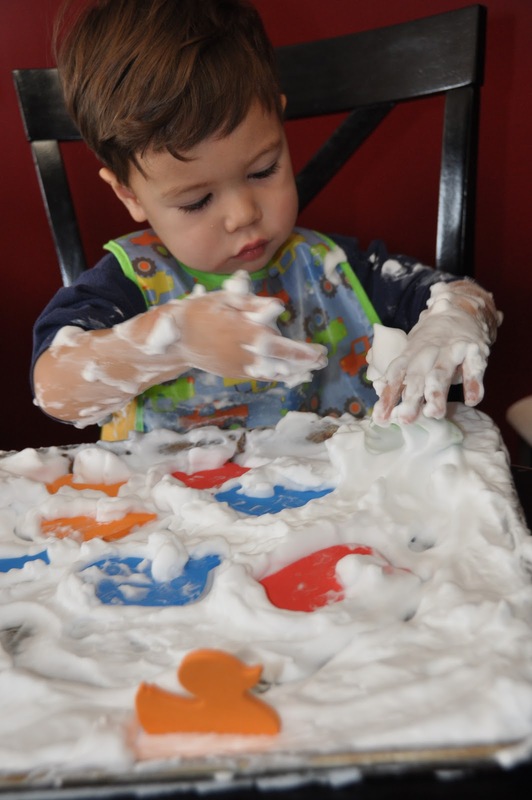 Shaving Cream fun– I brought out the shaving cream and we created our own examples of the landforms. 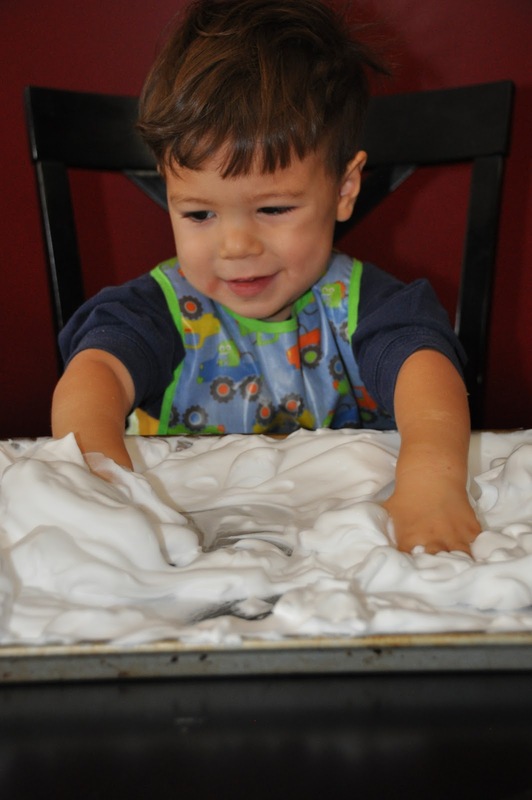 Warning – you will use A LOT of shaving cream if you truly want to make quality landforms. 🙂 I bought a can at the dollar store. 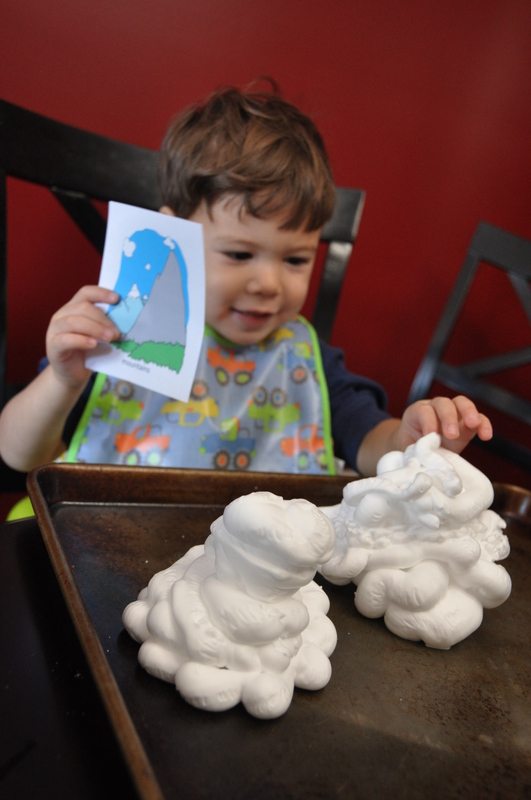 J was 2 years old when we did this activity and did need some help making a few of the landforms. TIP: it’s a good idea to start with the mountains! After all the landforms were made, J “labelled” each with the correct picture. Of course he had tons of fun digging in the “dirt” too! We threw in some bath foam fish, nothing to do with landforms but he liked it. 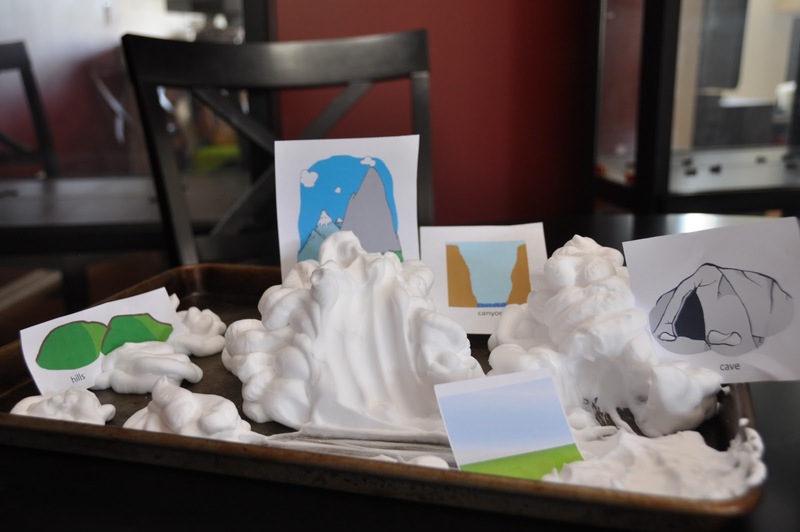 Landform Obstacle Course – For our last landform activity, I set up an obstacle course in the living room. Pillows on the floor were islands that he had to hop on. Pillows stacked on a chair was our mountain. A blanket thrown over the table created our cave. I pushed the couch up to the chair to create a “canyon” in between. We talked about each landform in the obstacle course and went on a “bear hunt” through the obstacle course. It’s so much more fun moms if you join in the climbing and hopping! And finally we played a game where I called out a landform and he had to climb, crawl or hop to it. Lots of fun! 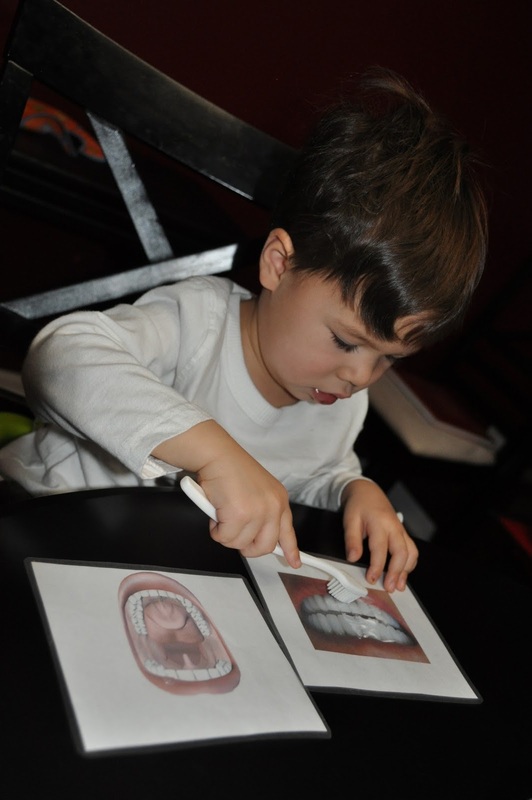 Before J’s first trip to the dentist, we did a quick unit on teeth. We talked about why to brush/floss, how to, especially bad foods, etc. Here’s an activiity we did that turned out pretty fun and useful. fed the photos some good and not so good foods. We took note of how each food effected the teeth (ex, icing got stuck all over the teeth). 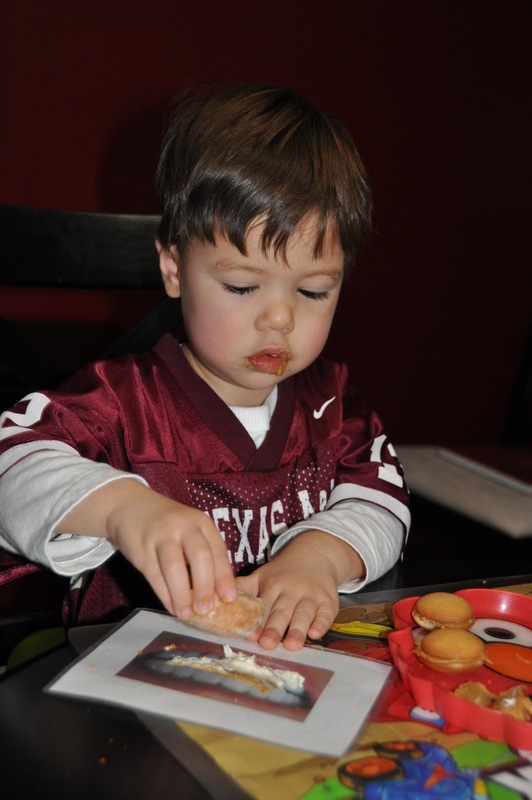 Of course I let him try some of the foods too, as evidence shows in the photo! It did give him some real experience with how the foods felt in his mouth and helped him better describe the feeling. Then we practiced brushing the gunk away. It was a good way to get him to see the purpose of brushing. We talked about where to brush (front, back, top, sides,…) and how to brush and practiced the strokes. After our fake teeth were clean, we headed upstairs to brush some real teeth. We’ll probably do more practicing like this as he gets older. This was a fun way to teach and practice a very important part of life. We started a new tooth brushing song during this activity. I got tired of our normal brushing song (This is the way we brush our teeth… like the mulberry song) and decided we needed a change. J thinks our new brushing song is fun. I sing to the tune of “I’m Gonna Wash that Man Right Outta My Hair”… and just change the words to… I’m gonna brush that cheese right off of my teeth, I’m gonna brush those blueberries right off those back teeth… filling in whatever he just ate and wherever I’m brushing in his mouth. He likes to remind me all the different foods I have to brush off. A year later and he still loves to sing this song! Back when I taught middle school kids I was so surprised that mood was completely lost on so many students. They read in a monotone, word by word manner. No wonder they found it boring! I definitely don’t want J to get stuck in that rutt. Reading is way too much fun for monotone. So I was THRILLED when we discovered Mo Willems at our local library. His books are perfect for teaching and practicing inflection, even for the beginner or intermediate reader. And it doesn’t hurt that he is hilarious for both child AND adult. We especially love his Elephant and Piggie series. In fact I liked “We are in a Book” so much that I decided to go out and buy it and I’m becoming quite the snob in books I deem worth my money. “BANANA!! !” has become a source of laughter all throughout our day (you’ll have to read the book to find out why). There are so many great things about these books. They are simple enough that J can read them all by himself but the story is still good enough to keep both of our attentions. So many of the beginning reader books are boring! These books aren’t marketed as beginning reader books, but I think they work great for that… or maybe for intermediate readers. I’m not an expert in early readers! If your child has a good base of sight words and a basic understanding of phonics, I think they will manage the Elephant and Piggie books well. We can also read them together, each taking a different role so that we get to act the book out. J even wants us to imitate the faces as we read/act. He has learned what think bubbles are and is getting great practice at reading with inflection which I just love. It’s so fun to hear J imitate the emotion and read happily, sadly, with disappointment or surprise, disgust, greed, embarassment, or even dismay, all depending on the story. That is such great practice! Willems does a great job of showing the emotion on the characters faces as well as changing the font to get the mood across (tiny font or gigantic font, italics, wiggly font, etc). Even my 3 year old can figure out it out, many times on his own! And of course he’s getting great practice at how to interpret the punctuation as he reads. Often J can pick up the purpose of the punctuation or font type on his own from the context of the story. There have been times that he’s asked why the font was so tiny or why the exlamation mark and the question mark are together. Another plus! The books encourage him to take the initiative so that he gets it right. And did I mention that these books are funny? J and I just giggle the whole way through. I love that he is getting such great practice reading AND enjoying every second. I’m so thrilled that Willems wrote so many books in this series. We’ve probably read at least 10 different Elephant and Piggie books and have lots more to check out at the library. **Willems also has a the Cat the Cat series (seems to be ideal for very early readers since he uses lots of repetition and use of the same word family throughout the book) and the Pigeon series (that will be next on our list to read through). Operation Christmas Child’s shoebox campaign in underway! The national collection week in November 14-21, 2011. You have 2+ weeks to plan and participate. Plenty of time! I am actually printing off the materials this week and planning to take J shopping over the weekend. Click on the link above to find out more. This is a wonderful way to help little ones practice giving. 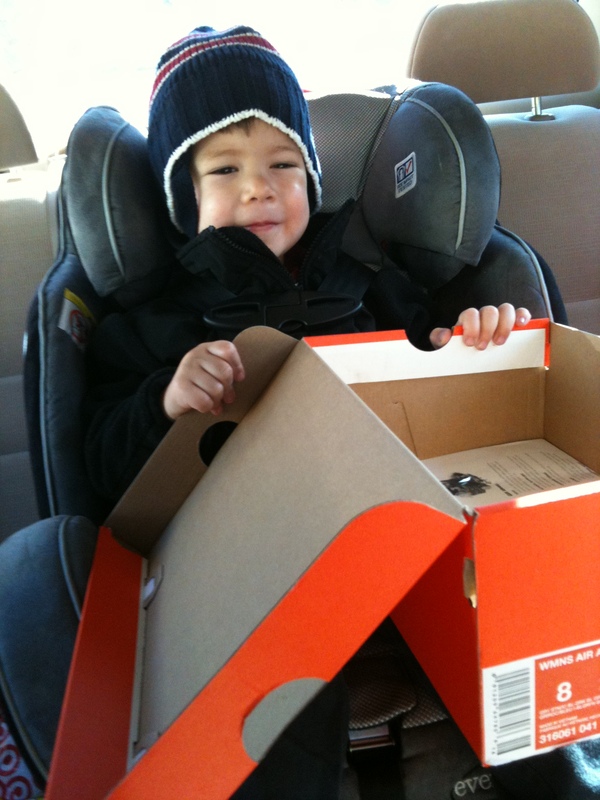 They can bring a shoebox to the store and fill it with fun (and useful) items. Bring it home, pack it up and drop it off at a pick up location near you. There’s even a tracking feature so you can find out where your box ended up. J loved this last year (the photos shown are from last year). We can’t wait to get started this year! Last year J was set on being a race car driver for Halloween. Give me a quick and easy store-bought costume anyday. So I happened on a great race car driver costume at the Disney Store (the link shows the 2011 version) and called Halloween-prep completed. In the back of my mind, I kept thinking he needed a race car to go with his outfit. Fast-forward to October 30th about 8 pm. My parents were visiting and my mom agreed. He needed a race car. That night we ended up crafting a Lightning McQueen race car out of a diaper box, wrapping paper and a few craft supplies I had around the house. Our finished product turned out so cute! J loved it. In my non-biased opinion, he was the cutest trick-or-treater around! How to: It was so quickly crafted (and so long ago), I don’t remember details. Lots of folding and refolding cardboard (the hard part), taping and retaping! We wrapped a diaper box in metallic red wrapping paper (it was actually Christmas paper but you can’t tell), added some foam tires, construction paper eyes and decals (the letters are foam stickers). 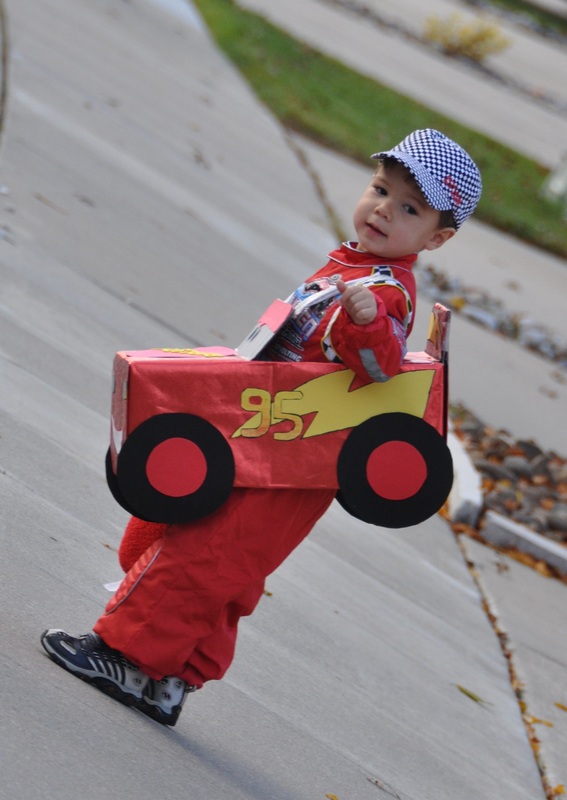 A little a lot of tape and glue and you have the perfect race car for a Lightning McQueen fan. Using duct tape, we attached Christmas ribbon to act as suspenders so that J could wear his car for trick-or-treating. This year…. 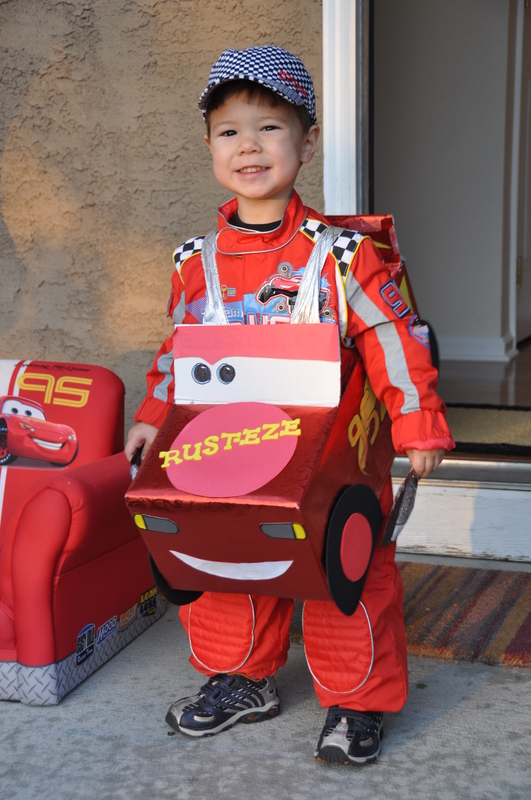 J’s again adamant that he is a race car driver and wants the SAME EXACT costume. Part of me says, “That’s not much fun!” and the other part sighs with relief. No work needed this year! Fall Index 2011 is up! The Fall Index page includes my favorite finds that I’d love to try out over the next few months! And while you’re at it these are some of our favorite activities from fall’s past. Sometimes our library visits are well organized, I’ve searched for books ahead of time, placed some holds, and researched authors. Other times, it’s a random treasure hunt. I love when you just happen to find great reads roaming the shelves! I have a feeling both of these authors will be place on our favorites list. 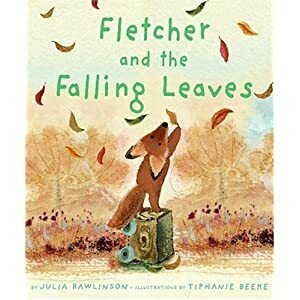 Fletcher and the Falling Leaves by Julia Rawlinson is wonderful. Fletcher, an adorable little fox is concerned for his good friend when it begins shedding…. leaves. He tries to come to his friend’s rescue to no avail. Then he discovers that his friend still has beauty to share. Fletcher is simply adorable. The artwork by Tiphanie Beeke captures the story perfectly. I love it! South by Patrick McDonnell is a picture book, perfect for a toddler or preschooler “reading” on their own or for mom and dad to join in. A tiny bird sleeps through the last moment of fall, and finds alone when all his bird-family have flown south. A friendly cat saves the day as they make the trip towards southern warmth together and the tiny bird reunites with his family. No words, just pictures. A story beautifully told. Enjoy storytime and then go outside and play in the falling leaves! I know I haven’t been too consistent in posting lately. I am crazy busy around here, planning and prepping for J’s new routine…. plus all the normal mom stuff. I should’ve taken a class in efficiency in college! Good news is we are both loving the new routine so it’s all worth it! I want to get more experience under my belt before I post about it though. In the meantime, here’s some great fall activities to try out!